As I write this, I’m close to half way through engraving a batch of wooden pen boxes for Bryn Jones of Prestige Pens, based near Caernarfon. Bryn is a wood turner who I met at the Wales Spring Fair in Llandudno. As well as wooden bowls, he makes fabulous wooden pens, turned by hand from a wide variety of native and exotic woods. He sells them at craft events, through shops in North Wales and through his Prestige Pens web site. 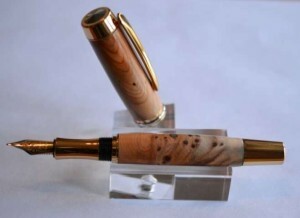 Much of the wood he uses has dramatic grain patterns, so every pen is a one-off. 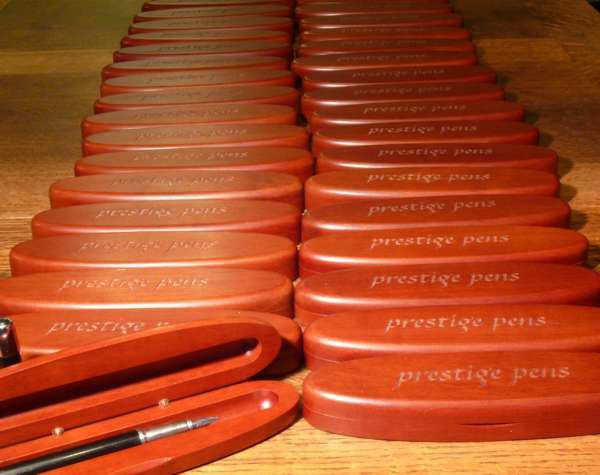 To give his pens the finishing touch, he offers his customers a wooden box to keep them in, engraved with his logo. He seems to be doing well, judging by the number of boxes he’s using! Laser engraving is a flexible way to mark wooden boxes like these, with the ability to prepare batches as and when needed, or to do small runs of bespoke designs if required. The Woodwasp shop will be taking a break for Easter – we’re closed until Tues 7th. 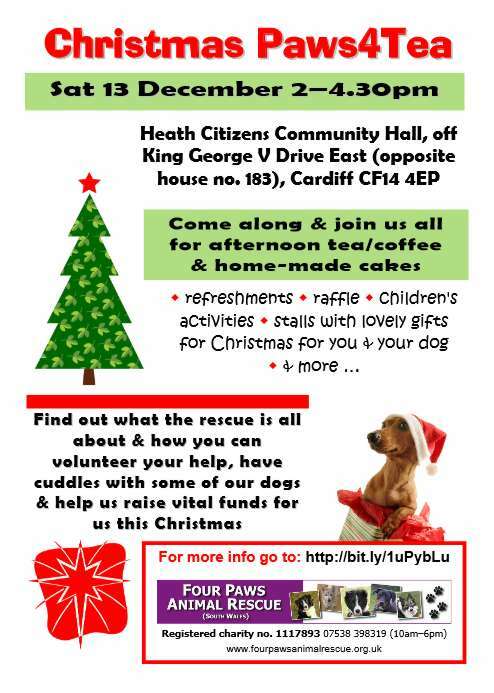 Fourpaws Animal Rescue are holding one of their regular Paws4Tea events on Saturday 13th December from 2-4.30pm. 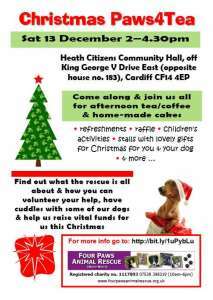 It’s taking place at Heath Citizen Community Hall off King George V Drive East, Cardiff, CF14 4EP. These events are always lively, with lots going on; stalls, refreshments, fun, friendly people and dogs. The second event is Cowbridge Christmas Craft Fair and Children’s Fun Day. 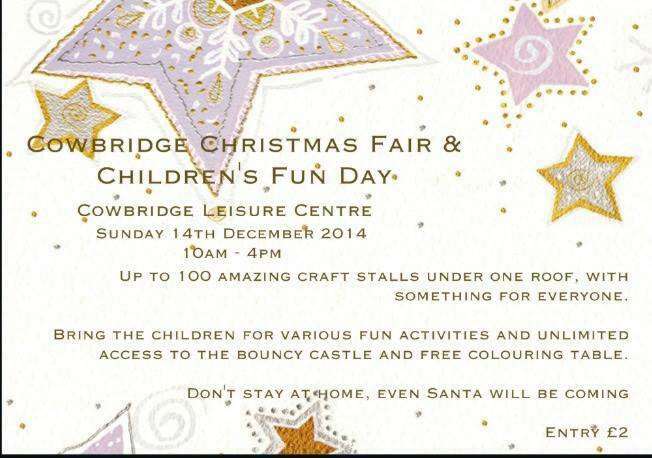 This takes place on Sunday 14th December from 10am to 4pm at Cowbridge Leisure Centre. This is a large craft event which is expected to have around 100 stalls. 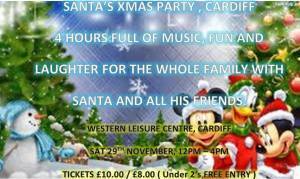 There is also a childrens fun event, which includes a bouncy castle, face painting, pottery painting, sand art, mascots and much more. … and of course if you can’t make either of these events you’re welcome to get in touch or order online. We’ve got two fairs lined up for the coming weekend. The first takes place at Cardiff High School on Friday evening (5th December), organised by the Parents & Teachers’ Association. It opens between 6pm and 9pm. We’ve not been to this one before, but from what we’ve heard they do it in style – there will be over thirty stalls. 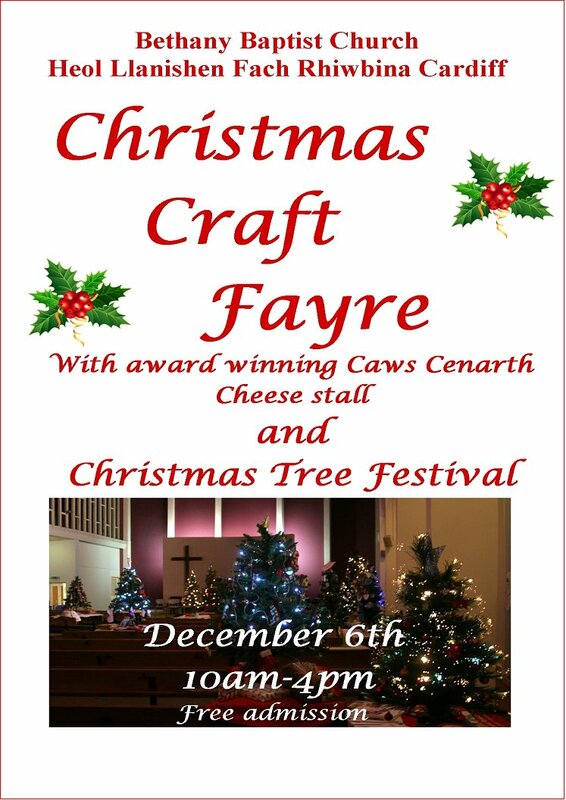 The following day, Saturday 6th December, we’ll be at Bethany Baptist Church in Rhiwbina. This is the church in Heol Llanishen Fach (we’ve been warned there’s sometimes some confusion). 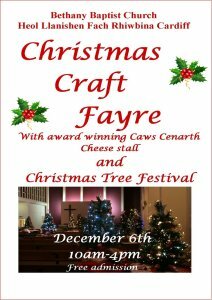 Their fair is open between 10am and 4pm and coincides with their Christmas Tree Festival. Our planned event at Western Leisure Centre was cancelled at the last minute, but we’ve been fortunate to get a space at Roath Market instead. 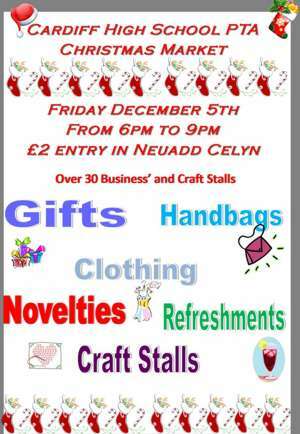 The craft market is held inside the Mackintosh Community Centre (38 Keppoch Street, Roath, Cardiff, CF24 3JW) between 9:30 am and 1 pm, while the Roath Food Market is held outdoors in the car park. We’ve not attended this one for a long time, but it’s always been fun and it’s good to be back. There are lots of interesting craft stalls, friendly people, and fantastic food outside. EDIT: This event has been cancelled ‘due to illness’. We’ll be going to Roath instead (details in the following post). There’s a Christmas craft fair / fun day for children, at Western Leisure Centre tomorrow – 12 – 4pm. 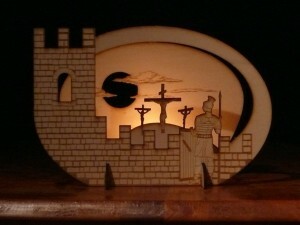 Woodwasp will be there for Christmas goodies. Semalt, Kambasoft referer spam – a new ant in your shirt! As well as designing and making things with the laser machine (the fun stuff), a frustrating amount of time goes on maintenence tasks that look like they should be simple. Here’s yesterday afternoon’s (and last night, and last Wednesday’s) example. I’ve included some detail in the hope that it will help someone else. When a visitor’s browser requests a page from your site, their request includes a lot of information that no-one normally sees, including a tag called ‘referer’, which tells you what site they came from. If you use a tool such as Google Analytics, you can see a handy list of all the sites that link to you and how many visitors arrive by that route. Recently, mysterious unfamiliar names have started appearing. It turns out they’re not real visitors, but robots designed to fill your log files with their own web site address. To make themselves harder to block, the most prominent one keeps changing its IP address (by rudely using other people’s hijacked computers) and referer tag (eg from ‘semalt.com’ to ‘semalt.semalt.com’ to 123.semalt.com’ etc). They are making it hard for people to interpret their logs, skewing statistics and causing a lot of irritation (Google ‘Semalt’ if you want to get more detail, some theories on why they are really doing this and a flavour of how worked up people are getting). Check your web server runs Apache (http://browserspy.dk/webserver.php will tell you). If your server runs Apache you can normally change your configuration by including instructions in a file called .htaccess, which is kept in the directory where your html files are stored. Get an FTP client program (I used FileZilla) to allow you to view, transfer and edit the files on your server. If one already exists, download your old .htaccess file to your own computer and save it somewhere safe so that if it goes horribly wrong you can put things back as you found them. Edit your .htaccess file to include the blocking code. As the file name starts with a dot, you might need to save the file on your computer as ‘htaccess.txt’, edit it in Notepad, upload the new version to your server then rename it back to ‘.htaccess’. Check your web site still works correctly (this is where you might need the old .htaccess file that you saved in Step 3). Check that your new .htaccess file hasn’t slowed your web site down. Judge it by eye, or Google has a tool that will give you a numerical score and tips on what’s causing the delay. You’ll either get the whole of www.mysite.co.uk’s source code scrolling across your screen, or an error message which tells you that the block has worked for that referer. I used this to confirm that referers such as semalt.semalt.com and 555.semalt.com are also blocked. Take care not to inadvertently block friendly traffic (eg if your RewriteCond line uses the term ‘malt.com’ it will block ‘semalt.com’ but also ‘deliciousbarleymalt.com’). Keep an eye on your website and your analytics data to make sure it continues to work as expected. I’m afraid new spammers will crop up and have to be added to the list. Fortunately, you can have any number of RewriteCond lines. The machine’s assembled, the cooling water is cool, the website is reactivated and we’re ready to go. 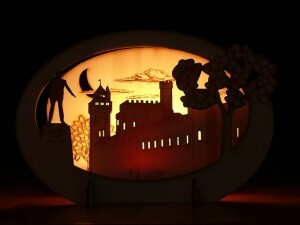 Have a look at our shop to see the latest designs. Woodwasp will be closed until Sun 30th Aug. The online shop will be open for browsing but you won’t be able to make any purchases. If you email us during that time we’ll be happy to take your orders but we won’t be able to make or post anything until Monday 1st Sept. The machine is tired and is having a rest!! It’s frustrating how sometimes you can struggle with something for ages and make no progress. If you are able to leave it for a while before trying again, if you’re lucky, everything might click into place. Cardiff Castle is such a prominent Cardiff building that quite a few people have asked why I haven’t included it in the range of candle holders. I’ve tried it from a new viewpoint and I’m very pleased with the result.